Photo take shortly after the robbery in Warwick. Photo submitted. The owner of a Warwick jewellery shop which was robbed this week has vowed to come back bigger and stronger. On Tuesday afternoon Hamlington’s Fine Jewellery, which is in Market Place, was targeted by three masked men, one armed with a crowbar. Photo taken shortly after the robbery in Warwick. Photo submitted. David Hamlington, owner of Hamlington’s Fine Jewellery, which has been in the town for eight years, said: “It was a relief that no one was hurt. Thankfully, everyone is okay. “Things can be replaced but people can’t. “Everyone acted (during the incident) how they were told to during their training. The police were swift to respond and hopefully they will find them. “Everyone is fine but things like this can leave mental scars and people can carry things like this with them for the rest of their lives. It is going to take time to get over this but we are not giving into it and we will be back open as soon as we can. “We have had so many messages from our customers and from people who know us asking when we are reopening and if we are okay. “They have taken high-value items and a lot of them were display items. “Some of these items have been advertised in the Leamington Courier, Warwick Courier and the Kenilworth Weekly News over the last year. A spokesperson from Warwickshire Police said: “We are appealing for witnesses and information after an incident in Market Place around 4.45pm on Tuesday (16 January). “Three men wearing balaclavas, with one carrying a crowbar, are reported to have entered Hamlington’s Fine Jewellery shop and proceeded to take a large quantity of jewellery from cabinets within. 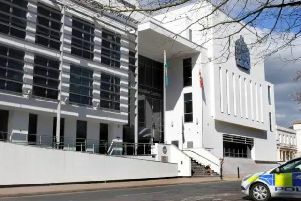 Detective Inspector Tim Sharp of Leamington CID said: “We take all reports of this nature very seriously and a thorough investigation has been launched. We’re thankful that nobody was injured during this incident, but it was an understandably distressing ordeal for those involved.